“C’est la vie (Say the Casualties! 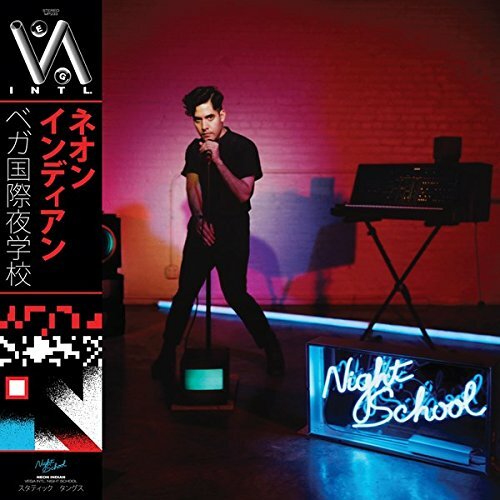 ),” the twelfth track on Neon Indian’s latest record is disguised as a cheesy yet feel-good Madonna-channeling 80s pop song. But at exactly a minute and forty-five seconds, a cartoonish drum beat interrupts the pace, and spirals into an unknown universe. The underwater and space warbles that were creeping in the background bloom into an almost chiptune, Mario-esque theme song before synth-pop brainchild Alan Palomo sings it back to the human world. Not only does this thrill propel throughout VEGA INTL. Night School‘s 50 minutes, but it also parallels Palomo’s musical career in taking unprecedented turns into the unfamiliar, fore fronting the internet’s most zealous chillwave sector since 2009. The Italo-disco traces from Psychic Chasms still backbone the cyber-bred timbre, but Palomo hones his craft through masterful constraint and release. “Slumlord” uses a reoccurring buildup formula without losing its eccentric vigor. He two-steps with Daft Punk funk-ery in “The Glitzy Hive” and “Bozo,” while moonwalking with the ultraslick “Annie.” The night continues with a soul-bearing R&B bodyroll on “The Skorpio Magazine,” some Fripp-ian shreds on the proggy “Baby’s Eyes,” and then a glide onto the techno dancefloor on “Street Level.” Gumball machines, laser gun noises, spaceship noodlings, and world roots all pour into the huge melting pot, transforming into candy sweet synths with just the perfect amount of sweetness. VEGA INTL. makes Neon Indian’s brilliant former chillwave seem like a transitional teen phase. Whether or not it has reached its final form doesn’t matter to Palomo, as he keeps regenerating the aural sphere around him, leaving us desperate for another VIP pass to his retro-futuristic utopia.